Today is the last day of the Blogging Marathon# 7. As always Blogging Marathon is sure to get your adrenaline up, at least it sure does mine. The first week kind of went off well. I was happy getting to know and make some new dishes. Even when the second week started, I wasn't sure which ones to make, though I decided on Crunchy Snacks, in lieu of Kid's Delight. Finally after much thought I decided I should bake some cookies, both sweet and savory. So I experimented with some of the recipes that has been with me for a while. After four days of cookies, I thought I should do something different. So you saw some baked nuts, baked masala nuts and finally today baked Potato Chips. 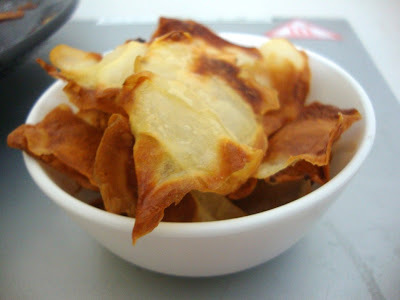 I recently deep fried Potato Chips. 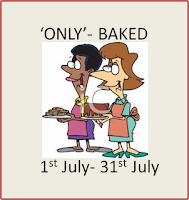 And thought baked version must also be great. I remember Divya doing it. I got a very thin potota slicer from Amma, so the chips came out really thin. I had totally baked it for 20 mins, I think 18 mins should have been enough. But Konda loved it with the browned sides and all. So in the end it really doesn't matter as long as your kid loves to eat it. 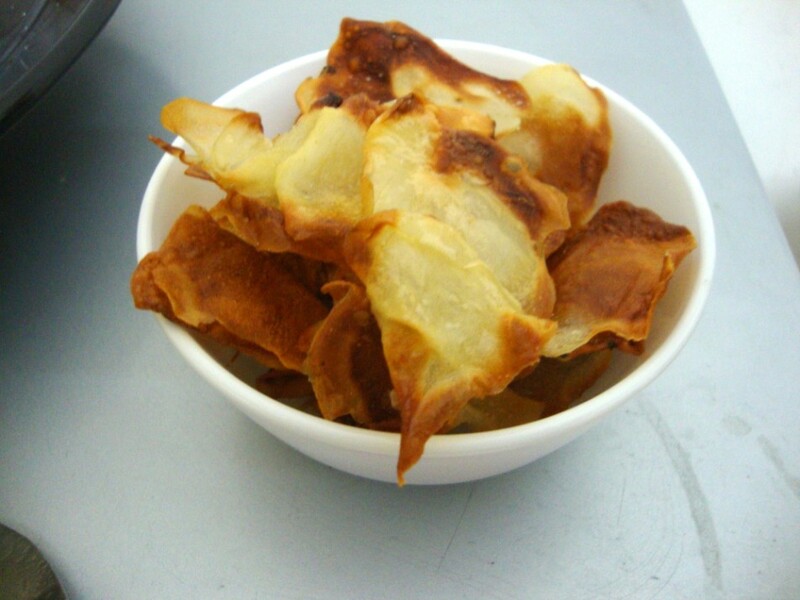 Toss oil over the chips and mix well. 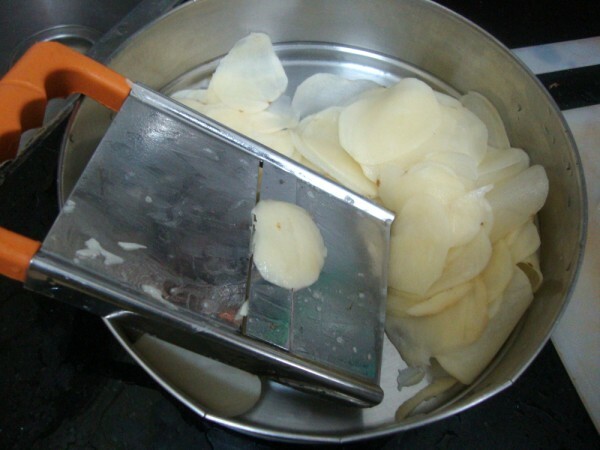 Wash and peel the outer skin of the potatoes, pat dry and using the slicer, slice them into thin ones. 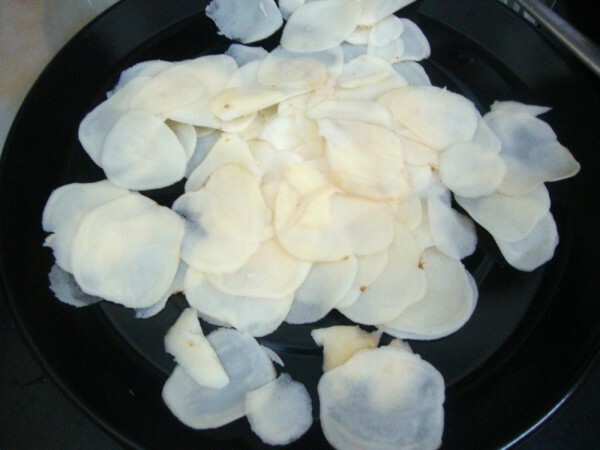 Wipe the sliced chips over a cloth, take them in a bowl, add oil. toss it well. 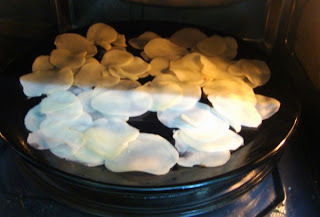 Then spread them over a greased baking tray. 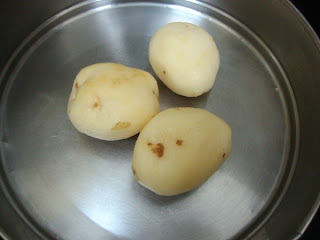 Pre heat the oven at 200C, then bake for 10 mins. Turn over the potatoes and again bake for 5 mins. Turn them over again, bake this time depending on how well the chips are done, for 3 - 4 mins. Remove, sprinkle salt and chili powder. If you missed out the posts in the Blogging Marathon, check them out now.